Front row: Bjørn Kristain (Marita's boyfriend), Marita, Me and Dorthea (Jørn's girlfriend). I lived with Jan & Margrete and Marita at the time. Jørn has just moved back home to Stryn with his girlfriend and child and will be expecting a new child in the Spring. Kurt is still living and working in Oslo. Both of them are great guys. Stryn is the town in which we live. It is a nice little town in the Western part of Norway, which is the most beautiful place in the world. Marita is my host sister. She is so awsome, and I am so glad to live with her. We recently started a bell choir in town, which happens to be the first in Norway Go Martia!! We both attend Stryn Vidergåande Skule as final year students. She was an exchange student last year in Orange, California. 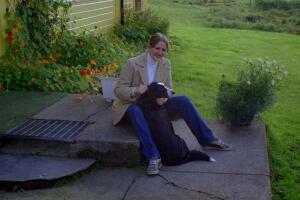 She has a website at the following: Marita's Webpage. Here is Jan Sætre, my host father. He is quite cool and has tons of jokes! As his says, Professionals are Professionals! He is a farmer on his family's Farm. 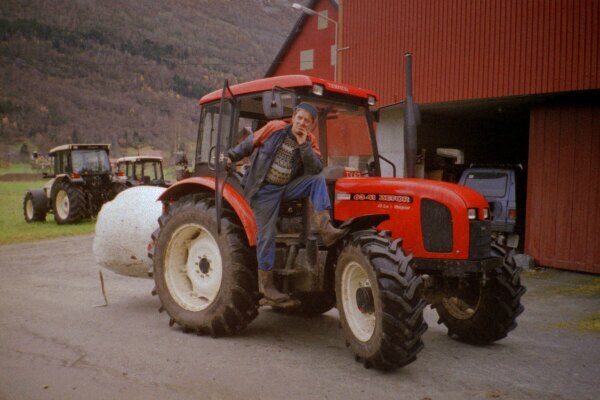 This is a picture of him with his new tractor.